Pressure grows on Saudi Arabia to explain the fate of journalist Jamal Khashoggi, who vanished October 2 while visiting the Saudi consulate in Istanbul. Police searching the Saudi Consulate in Istanbul have found evidence that Saudi writer Jamal Khashoggi was killed there, a high-level Turkish official said Tuesday. Khashoggi, a critic of the conservative monarchy who he lived in self-imposed exile in the United States, went missing on Ocober 2 after entering the consulate to obtain paperwork he needed to marry his Turkish fiancée. Turkish officials believe he was killed inside the consulate and had wanted to search the consulate for days. Permission apparently came after a late Sunday night call between King Salman and Turkish President Recep Tayyip Erdogan. US President Donald Trump said Tuesday he had spoken with Saudi Crown Prince Mohammed bin Salman and been assured that a "full" probe into the disappearance of a critical journalist is underway. "Just spoke with the Crown Prince of Saudi Arabia who totally denied any knowledge of what took place in their Turkish Consulate," Trump said in a tweet. He "told me that he has already started, and will rapidly expand, a full and complete investigation into this matter. Answers will be forthcoming shortly." Trump previously warned of "severe punishment" for the kingdom if it was found to be involved in Khashoggi's disappearance, which has spooked investors. On Monday, however, Trump offered a different theory after speaking by telephone with King Salman. 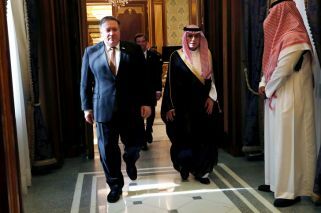 US Secretary of State Mike Pompeo travelled to Saudi Arabia to talk to King Salman and the 33-year-old crown prince Mohammed bin Salman, who not long ago basked in international praise for his domestic reforms but whose reputation has soured over his mounting crackdown on dissent. 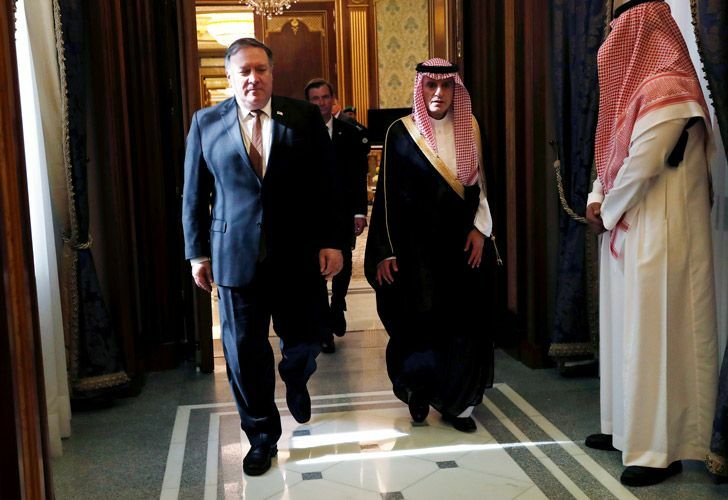 Meeting King Salman, Pompeo "thanked the king for his commitment to supporting a thorough, transparent and timely investigation of Jamal Khashoggi's disappearance," US State Department spokeswoman Heather Nauert said. While the message behind closed doors may have taken a different tone, Pompeo was full of smiles and exchanged pleasantries with leaders of the longstanding ally, with no ostensible sense of crisis. The Turkish foreign ministry announced Pompeo would head on to Ankara on Wednesday for talks. But the Saudis have faced intense criticism over the Khashoggi incident: There have also been sharp words targeting Mohammed bin Salman from US senators on both the Republican and Democrat sides, amid calls for Congress to halt US arms sales to the kingdom. UN human rights chief Michelle Bachelet said today the "inviolability or immunity" of people or premises granted under the 1963 Vienna Convention on Consular Relations "should be waived immediately." That convention covers diplomatic immunity, as well as the idea that embassies and consulates sit on foreign soil in their host countries. "Given there seems to be clear evidence that Mr. Khashoggi entered the consulate and has never been seen since, the onus is on the Saudi authorities to reveal what happened to him," the former Chilean president said. The controversy has not only troubled Saudi's traditional Western allies, which are key arms suppliers to the kingdom, but undermined efforts by Mohammed bin Salman to present himself as a modernising ruler. US Treasury Secretary Steven Mnuchin said he still plans to attend but would take "into account" any new information. The controversy also threw into doubt a $400 million deal the Saudi Public Investment Fund negotiated with Hollywood's most powerful talent agency as part of the crown prince's drive for a foothold in the entertainment industry.